My name is János Huszka MD. I graduated in 1975 at the Faculty of Medicine at the University of Szeged in Hungary. In January, 1978 I started working at the Otorhinolaryngology Clinic of the same university, where I acquired a basic knowledge in Otolaryngology under the supervision of Dr. Ottó Ribári. I took an active part in the practical teaching of medical students and scientific research. Soon afterwards I started to work at the Otorhinolaryngology Dept. of Pest County Hospital in Kerepestarcsa where I was working for almost 20 years under the supervision and direction of Dr. Tamás Székely and his successor, Dr. Miklós Becske. Here I learned the whole professional vertical of otolaryngology and achieved a high level of preparedness in parotid gland and facial nerve surgery and also in the treatment of these disorders. In 1981 I took a special examination of Otorhinolaryngology. In 1986 I passed an intermediate English language exam. Between 1989 and 1990 I worked in Finland at the Otorhinolaryngology Department of the local county hospital of Joensuu. Here I gained special expertise in Otorhinolaryngology and Head & Neck Traumatology, moreover work experience of great value in the well-organised and modern Scandinavian health care. After submitting my application, in 1999 I obtained the post of Head of the Otorhinolaryngology Department (completed with the Department of Oral and Maxillofacial Surgery) in the Szent István Hospital in Budapest. These two departments together were a unique professional environment for me. Following my nomination my task was to harmonize the work of these two fields of expertise and to settle a reasonable cooperation. Looking back upon those 9 years I spent there, it can be ascertained that our efforts were not in vain despite the deteriorating economic and personal conditions from year to year. Our collaboration was synchronised and fruitful. In fact, we met almost every possible disease of the neck and head area. Such a vast surgical repertory was formed at our department that there were only a few of that sort at that time in Budapest. Our professional reputation reached far beyond the borders of the referral area. As regards the treatment of salivary glands neoplasms and diseases, especially the parotid gland, we could say that we became its centre in Budapest. This centre in the capital is now the Otorhinolaryngology, Head and Neck Surgery Department of the Péterfy S.Utcai Hospital and Trauma Center which I am directing since 1st July, 2008. In 2003 I took a special examination of Audiology. A year later I took a special examination of Oral and Maxillofacial surgery. 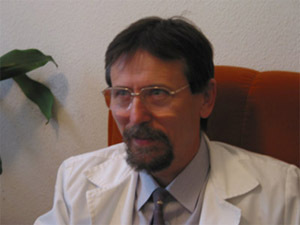 In 2008 I attained the post of Head of Otorhinolaryngology, Head and Neck Surgery Department of the Péterfy S.Utcai Hospital and Trauma Center. Currently I am fulfilling this position. In 2010 I completed the course Health Care Management in the Faculty of Economics at the University of Pécs. I maintain excellent relationship with the prominent representatives of the same profession, co-departments nationwide and also relevant university institutions. This fact is proven by the numbers of our clients, the requests for medical consiliums, lectures and essays, furthermore I received honourable requests to perform parotid operation at the ENT Clinic of Budapest, the Heim Pál Children’s Hospital, the Bajcsy-Zs. Hospital and also at the Jáhn Ferenc Hospital. Many times I have been asked to perform major neck surgeries in the Surgery Clinic of Semmelweis University, in the ENT Dept. of Dunaújváros, moreover we have performed operations together with the Department of Burns and Plastic Surgery of Szent István Hospital (e.g. maxillary reconstruction after resection of tumor). In 2013 I performed a major neck operation on a child who was three years old with an extensive tumorous disease. In 2003 at the ELS Workshop, organised in Budapest, I performed and demonstrated a laryngeal surgery in the Szent Rókus Hospital. A cooperation with the oral surgery made possible operations like mandibular maxillary surgery which is connected to Maxillofacial traumatology and I also carried out cancer surgeries. Apart from laryngectomy I have performed several partial removals of the larynx and hypopharynx, including LASER surgical interventions as well as supracricoid hemilaryngectomy with pharynx resection and also with neck block dissection (function preservative surgical approach). as well as broncho-oesophagoscopic surgeries. We have had patients from all over the country, including Makó, Kaposvár, Miskolc and Szombathely for hearing aid reasons, FESS and also for laryngeal and salivary gland tumors. Some people even came from the United States, Austria, Slovakia and Romania and there was a doctor who brought his 18 year old son with parotid tumor for a surgery to us from Kiev, the Ukraine. Numerous patients were sent to our department to get surgical treatment for reasons of ear diseases resulting in intracranial complication from the Szent László Hospital of Budapest, for reasons of removal of penetrating intraorbital bodies, also for LASER laryngeal surgery from the Flór F. Hospital, to provide aid to severe facial nerve damage, to carry out operations on patients with parotid tumor from the Szolnok County Hospital, moreover in order to perform a facial nerve reconstruction surgery on a child who was sent from the Bethezda Children’s Hospital. Depending upon my possibilities I have participated almost every oral surgery and otorhinolaryngological congress in Hungary, moreover at those occasions I gave lectures and took an active part in the work of round table discussions. I have visited congresses abroad like Duna symposium, European and World congresses, congresses in Austria, Germany, Croatia, Slovenia, Italy, Greece and France as a lecturer, I participated in round table discussions, and presented movies and posters. I have 19 publications released. Approximetly, I have given 70 lectures, nine of those in English and one in German. surgical treatment of neck infections and abcesses. While studying about patients with parotid gland diseases I dealt with the complications of parotid surgery, most significantly with the Frey syndrome. During that research time I developed a treatment which can help to stop that rather disturbing symptom. In Hungary I was the first to try out and apply successfully botulinum toxin for similar reasons. Salivary gland endoscopy was applied and presented in Hungary for the first time as a new examining and treating process by me. This kind of minimal invasive diagnosis and treating technique is used only at the medical department directed by me in Hungary. In the last 10 years I enrolled in several training courses (ear surgery, objective audiometry and hearing screening, modern hearing aid treatments, rhinoplasty, laryngeal surgery, voice prosthesis implantation, rhinology and FESS, vestibularis examinations in France, salivary gland endoscopy in Switzerland), treatment of vertigo in Germany. In Austria I followed a training course on ear surgery. Formerly I participated in courses on bronchology, on facial nerve diagnosis and surgery, and on new tendencies in endoscopy. In the Otorhinolaryngologic Clinic of Budapest, Debrecen, Szeged and Pécs I g lectures at exam preparation and at post graduate courses. I have given a course of lectures also at the Semmelweis University in the Otolaryngology, Head and Neck Surgery Clinic for medical students. For 6 years I hold the title of secretary general of the Hungarian Society of Oto-Rhino-Laryngology, Head & Neck Surgery, furthermore I am a member of the presidency and board of directors in the same association. In the past 6 years I participated in organizing two, highly successful National Congresses with the presence of international authorities. In the Medical Chamber of Budapest I was entitled as the president of the supervisiory board for two years. I have been a member of the Vocational College of the Association for eight years. I am also a member of the Hungarian Oncological Association and the Society of Oral and Maxillofacial Surgery.